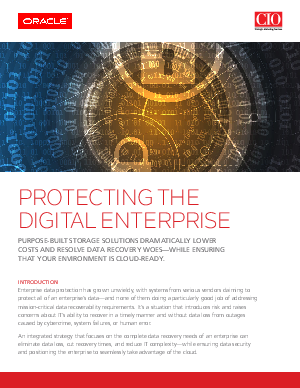 Enterprise data protection has grown unwieldy, with systems from various vendors claiming to protect all of an enterprise’s data—and none of them doing a particularly good job of addressing mission-critical data recoverability requirements. It’s a situation that introduces risk and raises concerns about IT’s ability to recover in a timely manner and without data loss from outages caused by cybercrime, system failures, or human error. An integrated strategy that focuses on the complete data recovery needs of an enterprise can eliminate data loss, cut recovery times, and reduce IT complexity—while ensuring data security and positioning the enterprise to seamlessly take advantage of the cloud.